The Soft-Pak solution can be either on your own in-house server or on our secure hosted cloud. Our cloud solution provides complete Soft-Pak functionality without a hardware investment. Ideal for operations that want to eliminate hardware purchases, maintenance, and administration expense associated with supporting in-house servers. A standard high speed internet connection (DSL, cable, wireless or cellular) is all that’s required; as the Soft-Pak application is platform and network independent. Leverage your existing equipment; as the Soft-Pak cloud solution works with most PC’s and printers. The complete package; including customer support, software updates and security all without having to manage more equipment. Soft-Pak maintains 99.99% uptime with both a primary and secondary data center with real time high availability replication software to ensure ongoing reliability. 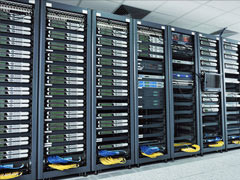 Both data centers are owned, managed and supported by Soft-Pak; we do not outsource equipment, software or support. No expense has been spared; as each data center maintains redundant power, multiple forms of connectivity, storage, and replacement equipment on site. Soft-Pak continues to test our DR ‘disaster recovery’ fail over process in an effort to ensure constant and reliable access no matter the emergency. Fast, secure and reliable; with thousands of users around the world supporting their billing, routing, scale and fleet operations, Soft-Pak’s cloud continues to deliver value. How secure is your hardware and your data? That’s a big question in today’s business environment. The migration to cloud services is the choice for most waste haulers. Simply put, you gain reliability, performance and security all why paying and managing less. Security is controlled by the client, so only company management or authorized administrators have access. Soft-Pak takes it one step further by contracting outside security experts to perform annual security vulnerability assessments. Just part of the ongoing investment to make sure our clients are secure. Prevent data loss, secure corporate information and ensure your operation is never down….. all on the Soft-Pak cloud. What is your disaster recovery plan when your main server fails? Do you have off site equipment and data storage at the ready? Who is responsible for reloading your dataset. How often is this tested? With a hardware failure, how long can you operate without access to your data? Is your hardware and security current and maintained? What vulnerability assessments have you performed? How are you storing clients credit card information? Do you currently own an internal server and who maintains the hardware? Can your IT staff address additional hardware concerns? Is your data secure and do you have an disaster recovery plan? Is your data securely stored off site? Does your office support high speed internet? Do you require database access from home or do you support remote locations? How easy is it to incorporate additional sites and users? Are you acquiring or adding new facilities? 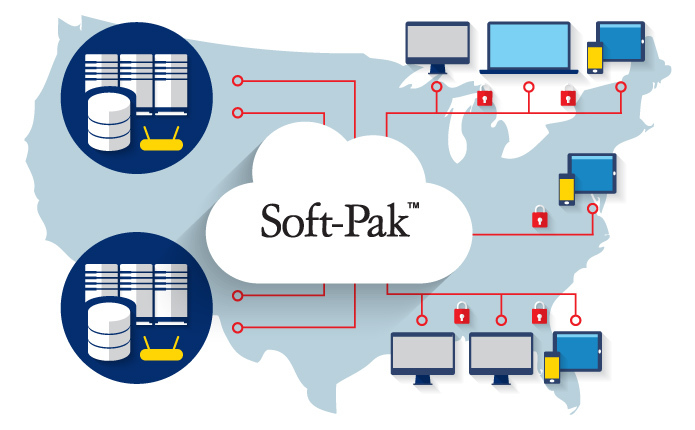 Soft-Pak created our cloud offering in 2002 when customers requested an affordable yet comprehensive operational software package without a hardware investment. The continued investment has been significant, but so has the popularity. Still not sure what is best for you? consult with our account managers and they can address technical and pricing questions. The best decision is an informed decision…. let us help you make the right choice for your operation.